Modern Cat Scratchers from Enchanted Home Pet 30% DISCOUNT FOR HAUSPANTHER READERS! Here’s a new line of decorative and functional cat scratchers with a wide variety of styles to choose from. Introducing Enchanted Home Pet corrugated cardboard cat scratchers and lounges. 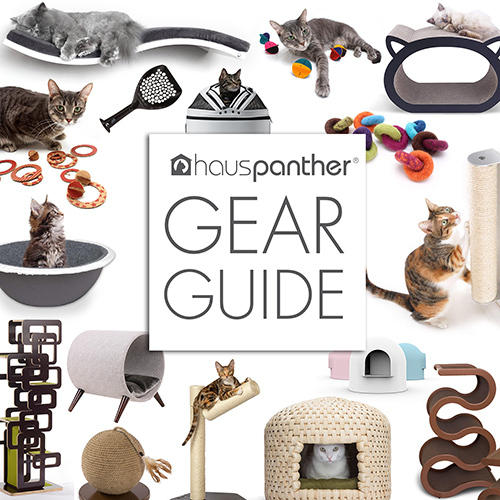 There are so many shapes and sizes, there’s sure to be one to please every cat! Designed with comfort and function in mind, these scratchers serve as furniture for your cat that she can also scratch on. The curved surfaces provide comfortable lounging spots and many of the designs can be used in multiple configurations — you can flip them over or lean them against a wall to change things up! Some of the designs have multiple parts as an added bonus. The design above includes a pop out box with fish shaped cutouts on both sides, perfect for sitting in or stashing kitty’s toys. There are several compact designs as well as larger pieces. All are made with sturdy non-toxic paperboard and glue. Prices range from $29.99 to $89.99. 30% OFF JUST FOR HAUSPANTHER READERS! Hauspanther readers can get 30% off regular prices on all cat scratchers when ordering at shop.enchantedhomepet.com! Just enter code panther at checkout to get the discount, plus you’ll receive FREE SHIPPING to US addresses. Cat Cookie Cutters for Your Culinary Creations! These are so cute and thank you for the discount!